Okay, I will admit that while my wife DID enter the room we played P.I. in, pretty much all the above did not apply. Still, if you are not sold on P.I. by now, I will try to work harder henceforth. Martin Wallace’s P.I. is a game of semi-deep deduction in which players each take the role of a private eye, seeking to solve their case as quickly as possible. But beware, there are lots of things going on, and each player is out to solve their case first. Each game consists of three mini-games, which makes for quick game flow and the chance to recover even if you get off to a slow start (possibly because the lady in red kept you… distracted). 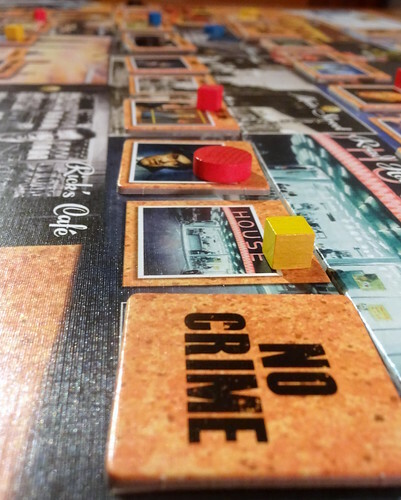 Each mini-game is set up on a board with 14 locations, and an equal number of potential crimes and suspects randomly allocated – although some locations will contain no crime, no suspect – or in coinciding cases basically a big ‘keep walking, nothing to see here’-sign in the window. Each player is dealt a hand also containing these elements (location, suspect and crime – without the blanks) – which describe the case your left-hand neighbor needs to solve. This also means you yourself are clueless about your own case to start with. The combinations dealt to players and the combinations set up on the board therefore do no match (except by chance), meaning that players will need to go all over the city to look for clues about who did what and where. You are also handed point markers, five Investigator counters as well as three wooden discs and several cubes of your color allowing you to keep track of your investigation. Play an investigator on any one location – This will prompt a thorough investigation of the chosen location, its current inhabitant (suspects) and activities (crimes). The investigator will also have a look at all adjacent locations and determine whether any of the neighboring burrows holds relevant information (location, suspects and crime). Depending on the success of the investigation, the P.I. will get more or less helpful clues. The right-hand neighbor of the current player will check the cards, and if one or more of the three aspects of the case are present in the chosen location will place a disc of the player into the burrow (but not allocate it to the specific aspect). For each aspect present in the neighboring parts of town (which can be between 3 and 6, depending on which location was chosen) a cube is placed in the burrow which is currently investigated. While a disc at least signals that one of the three is at the current location, a cube will only indicate something pertaining to the case is in the adjacent fields – but neither direction nor the category can be established on this clue (alone). While the investigation usually gives you most information in one turn, is important to consider is that the five investigator tokens are the only part of the game not re-stocked between the three mini-games, so these must be used with diligence across all three games. 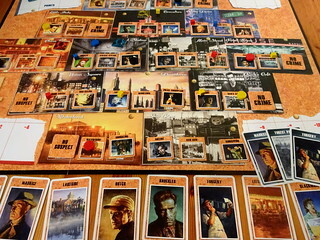 Use an Evidence Card – At the beginning of the game, a stack of evidence (containing one card each for all locations, suspects and crimes) is shuffled, and nine cards put face-up next to the board. Upon their turn, players can use their action to choose one of the face-up cards (which is then replaced) and investigate that particular category. So, if a player selects the card of a suspect, that suspect will be scrutinized (and a disc placed not only into that burrow, but right on top of the suspect token, if it is indeed the culprit). Likewise the suspects on all fields surrounding that person are taken into consideration, with a cube placed onto the suspect depicted by the card if the culprit is nearby. To be sure, the other two categories are left out of consideration and no markers are placed for (in this example) location or crime matches or neighbors. Therefore, this tool is particularly useful if you already have circumstantial information on one of the categories you want to verify (or exclude) – but you are obviously dependent on one of the nine cards currently available having the potential of giving you additional information. In case a card yields no clues, the player retains the card until the end of the mini-game, as a reminder of investigations that yielded no results. This is the action players take most frequently, and there is a substantial luck factor. However, with the right cards available it can be used to get some information on a big part of the board, albeit only for one of the categories. Try to solve the case – This is the easy – and yet often so difficult – part. When a player has all the information required (or simply feels lucky, or forced by circumstance), they may use their turn to guess the solution to their case, playing black discs onto the location, suspect and crime they believe to be ‘theirs’. As in all other investigations, the right neighbor will check the facts and confirm or disconfirm the results. A success will yield points (7 for the first to solve the case in each mini-game, and everyone to match that in the same round; 5 / 3 / 1 for each in the following rounds), with the mini-game ending after the round in which the penultimate investigator has solved their case successfully – thus prompting players to hazard guesses when not entirely sure. A wrong guess costs the player 2 points, but leaves them in the game to try again – often making it worthwhile to take a flyer on 50:50 chances in a round in which a case has been solved. 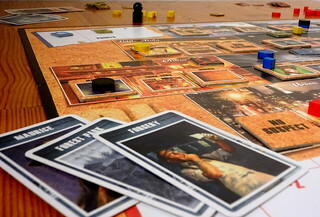 After each mini-game the board and cards are set anew entirely, with only the points scored maintained and the investigator tokens used discarded. The overall winner is the player with most points after three mini-games. P.I. entertains from two up to five players without major differences caused by the number of players. Having fewer players makes the game a little more directly competitive (e.g. by enabling you to specifically take the evidence card your counterpart needs) and nerve-wrecking, especially in two players. Once the other player solves the case, you have (at best) one chance to match it or you won’t gain any points this mini-game. The game materials are not extraordinary, just good old wood and cardboard, but they are solid and functional and the art perfectly matches the Philip Marlowe feeling of the game. And the player pieces five easily distinguishable colors, which doesn’t always go without saying. P.I. will not go into the depth of deduction like Sid Sacksons’ Sleuth, but remain more on the level of Incognito – given that it also contains a significant element of luck when it comes to cards available for investigation, as well as distribution of your infos across the board. That may make it a little less appealing to heavily strategy-oriented players. On the other hand this specific mix of luck and strategy, along with the straightforward rules and the very fast game play (a full game will play in less than 45 minutes) – provides a solid basis for players seeking a bit of thinking while a speedy and fun-oriented gameplay is retained. The Settlers of Catan have come a long way. From their little fictional island all the way to the USA in Trails to Rails and then all the way back to Europe to become Merchants of Europe. It’s been a long, strange trip.